Teaches the way your child loves to play. Learning library interactive system through which children can play action-packed learning games, read electronic storybooks, create works of art, and watch interactive videos. Play and learn essential pre-K through 2nd grade skills including reading, math, critical and creative thinking, story comprehension, and vocabulary. Children control the action using a multi-directional control pad or a touch-sensitive stylus. Includes a cartridge with six learning games. 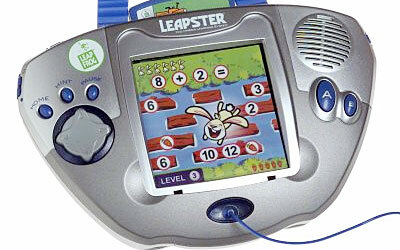 Full color system features a backlit screen for easy viewing, and a headphone jack for quiet play. Teaches letters, phonics, rhyming, spelling, numbers, counting, addition, subtraction, art, and music.